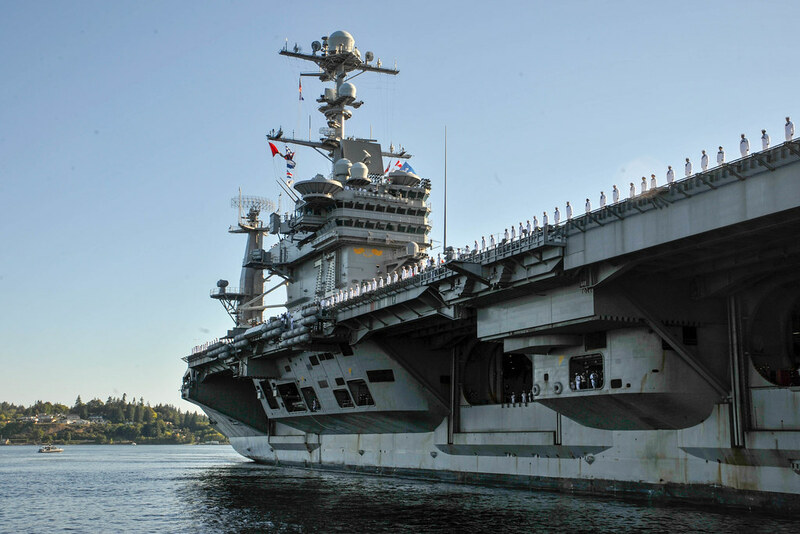 BREMERTON, Wash. - More than 3,000 Sailors aboard USS John C. Stennis (CVN 74) returned to their homeport of Bremerton, Washington, following a regularly scheduled seven-month deployment to the Indo-Asia-Pacific, Aug 14. John C. Stennis departed for deployment from Bremerton Jan. 15, and operated in both U.S. 3rd and U.S. 7th Fleet areas of operation, including more than 60 days in the South China Sea. During deployment, John C. Stennis worked together with allied nations, participating in multinational exercises including Foal Eagle with the Republic of Korea military, Malabar with the Indian Navy and Japan Maritime Self-Defense Force, and RIMPAC, the world’s largest international maritime exercise, with twenty-six participating nations, 40 ships and submarines, more than 200 aircraft and 25,000 personnel. John C. Stennis also conducted dual carrier operations with USS Ronald Reagan (CVN 76), during which both aircraft carriers performed coordinated flight operations. John C. Stennis made port calls to Guam, South Korea, Singapore, Philippines and Hawaii. Sailors had the opportunity to experience local cultures on their own or through Morale, Welfare and Recreation (MWR) tours. “I wanted to take a tour and see something I would never have normally seen,” said Aviation Boatswain’s Mate (Equipment) Airman Elisabet Laboymendez, from San Jaun, Puerto Rico. Laboymendez took an MWR sponsored tour of the Taal Volcano in the Philippines. Sailors also volunteered their time to take part in community service projects, working in schools, serving in soup kitchens and participating in environmental beautification projects. Over the course of deployment, John C. Stennis Sailors performed over 8,500 launches and recoveries of aircraft, conducted 30 replenishments at sea and received approximately 13 million gallons of fuel. The crew also hosted 580 distinguished visitors including the Vice President of the United States Joe Biden, U.S. Secretary of Defense Ashton Carter and Chief of Naval Operations Adm. John Richardson.